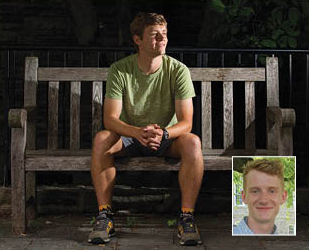 Brothers Evan ’09 (above) and Max Nesterak ’13 (photo inset) launched The Psych Report in summer 2013. Their online publication aims to bring the best of psychological science to the public sphere. Photo by Laurence Kesterson. An idea had been percolating in Evan Nesterak ’09’s mind for four years. As a psychology major, he wasstruck by the disconnect between psychological research and its application in the real world, and he was determined to do something about it. His brainchild, developed in close association with his brother, Max ’13, is The Psych Report (thepsychreport.com), an online magazine that aims to bring leading psychological thought to the public sphere. “Psychology is the science that is perhaps best positioned to help answer questions about today’s biggest problems—reducing poverty, providing adequate health care, ensuring a good education, to name a few. The problems we face aren’t due to lack of resources but rather due to a poor understanding of how human beings behave,” editor-in-chief Evan says. The brothers launched the site in July 2013. Among the many subjects The Psych Report has explored is how small, open-ended interventions can lead to more socially beneficial behavior. For example, it has been shown that electric bills that indicate how your usage stacks up against your neighbors’ can lead to more environmentally sensitive behavior. Similar “nudges” have increased the likelihood that people will participate in their employer pension plans and volunteer to be organ donors. Other research has shown that student success can often be better predicted by perseverance than intellectual talent, which may diminish the educational establishment’s preoccupation with cognitive testing. These represent just a fraction of the socially relevant research The Psych Report documents. Evan started the site because it is just the sort of publication he wants to read. In college, he completed his thesis under the direction of Barry Schwartz, Dorwin Cartwright Professor of Social Theory and Social Action. After a variety of postcollege experiences that included serving as caretaker of an historic Czech farmhouse and building trails in Maine, Evan circled back to Swarthmore and began laying the groundwork for The Psych Report. The publication had the strong support of Schwartz, who says, “It was a fantastic idea because there really isn’t anything like it.” He helped by recruiting an advisory board of high-profile psychologists, including Dan Gilbert of Harvard, Paul Bloom of Yale, and Angela Duckworth of the University of Pennsylvania, with track records for communicating about psychology in a way that the general public can understand. Consistent with the team approach he has enjoyed as a Swarthmore soccer player and now as a youth soccer coach, Evan works very collaboratively on The Psych Report. Several members of his founding team once joined him on the soccer field and in the psychology classroom. He gathers input from current undergraduates as well and took several to the annual meeting of the Society for Personality and Social Psychology in Austin, Texas, last winter. Max, a former co-editor-in-chief of The Daily Gazette who is now in Germany as a Fulbright scholar, writes stories and develops new content, cultivates relationships with scientists and other media outlets, and pursues funding opportunities. He has conducted interviews with eminent psychologists, including David Halpern, the head of the United Kingdom’s Behavioural Insights Team, an organization that advises the British government on psychologically based interventions. The Nesteraks’ next challenge is to make The Psych Report self-sustaining. Evan says that many of his “waking and sleeping hours” are spent developing his ideas for the publication and establishing it as a nonprofit, through Cultureworks, a Philadelphia-based organization that provides affordable shared-management resources. In the meantime, the brothers have “endless energy,” as Schwartz notes, and they continue to work closely together. Their aptly named website conveys both the nature of the information it contains as well as the brothers’ infectious zest for their singular magazine.